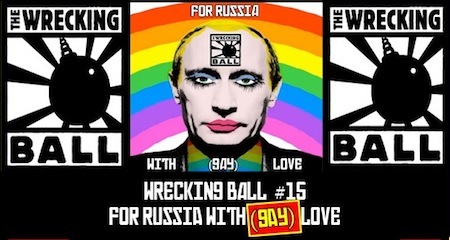 Wrecking Ball #15 presented For Russia With (Gay) Love at Buddies in Bad Times Theatre this past Sunday night. Inspired by Zee Zee Theatre’s “NYET: A Cabaret of Concerned Canadians”— an event that took place in Vancouver on the same night — it was a veritable Who’s Who of Canadian theatre coming together to showcase original works in protest of Russia’s new anti-gay legislation. Founded ten years ago by director Ross Manson and playwright Jason Sherman, Wrecking Ball is a politically charged event in which esteemed theatre artists tackle relevant political issues. This latest installment featured entries from queer and allied playwrights: Ronnie Burkett, Dave Deveau, Shawn Macdonald, Daniel MacIvor, Sonja Mills and Marcus Youseff. These were directed by: Steven Bush, Esther Jun, Erica Kopyto, Moynan King, Sue Miner and Gein Wong. Wow, right? The playwrights had one week to create scripts, the directors and performers had one week to rehearse, and all concerned had only a few hours of tech time to polish. Actors performed with scripts in hand, but it did not detract from the potency of the works. Bubbling underneath the proceedings was an intense passion and urgency. The overall impression was of a concerned community sharing their fears, compassion, and humour in the wake of Russia’s recently spotlighted internal repression. The enthusiasm on both sides of the audience/performer divide was powerful enough that said divide seemed to disappear completely. Such was the feeling of camaraderie that those of us in chairs were no less a part of the phenomenon than the people up on stage. It is simply not possible to do full justice to every piece I saw within the space provided here, so I will highlight the episodes that left the deepest impression on me. The show began with Vladimir the Beautiful, a satire by Sonja Mills in which Vladimir Putin awakes early one morning and launches forth his plans for a grand misogynistic restructuring of Russian society where the women will not be allowed to work and will be named either Anna (if they are good and pure) or Miley Cyrus (if they do not meet his ideal). Over-the-top writing and performances made this an uproarious opening bit that took clever jabs at the backward and repressive nature of Putin’s leadership. The Gay Heritage Project gave us a sneak-peak of the show they will be premiering at Buddies in November. Damian Atkins, Paul Dunn and Andrew Kushnir have crafted an homage to gay culture that explores its past, present and future. The trio presented three pieces: a dramatized interview with former Toronto Sun editor-in-chief who defended the publication of names of men who had been arrested during the 1981 bath house raids, a culture-clash meeting between an out Canadian theatre artist and a gay Ukrainian couple, and Damian Atkins hilarious one-man re-imaging of the Wizard of Oz in which Dorothy and her friends are on a quest to find a “gay heritage”. Catherine Hernandez presented a piece from her Femme Playlist in which she portrays her very own daughter giving a speech defining herself as the precocious child of a gay parent. While the content of this piece was less politically charged than some of the others, it was charming and irreverent. In Gay People, Da, da, da!, Gavin Crawford gives an amusing portrayal of Putin addressing Stephen Harper and the Canadian people to assuage their fears regarding his recent legislation. In an absolutely brilliant piece of satirical writing, Marcus Yousseff compares his recent treatment of homosexuals to Canada’s treatment of its natives. Putin Comes With Cheese & Gravy was Dave Deveau’s contribution—a moving scene where a teenage daughter asks her mother to sign a petition in defiance of Putin’s leadership. The mother is clearly uncomfortable with the subject matter, but she finds a way to use their conversation an opportunity to help her daughter come out of the closet. Moscow 76/13 was a touching (autobiographical?) piece by Ronnie Burkett in which a middle-aged puppeteer shares memories about Moscow with the young version of himself. There is something magical in the way he captures the naiveté and recklessness of youth from the vantage point of middle-aged nostalgia and despondency. Each of the works, entertaining and resonant in their own right, made up an evening of fascinating introspection from a worldwide LGBTTQ community full of individuals still struggling to identify themselves and understand their place in society. Afterwards, during a Q&A session, one deceptively simple question posed to the two panelists—recent émigrés from Russia—provoked an insightful discussion: What is the difference between the plight of gay people here in Canada and those in Russia? On the surface, the answer seems obvious: it’s worse over there! But the social climate in Russia and its impact on the homosexual experience is considerably more complex. The subject of sexuality (of any kind) has always been reserved for the private sphere and not considered acceptable public discourse. One panelist boldly posited that the recent anti-gay legislation is the first step a positive direction because the Russian people are now voicing the issues rather than allowing them to fester in silence. I look forward to the next Wrecking Ball and encourage everyone to follow this theatrical project as it challenges artists and audiences to examine the fabric of our social and political identity. Wrecking Ball #15: To Russia with (Gay) Love played for one performance only at Buddies in Bad Times Theatre (12 Alexander Street) on October 27.